Home » How-To Library » How Do Generators Produce Electricity? An electric generator is a device that transforms mechanical force into electrical current through a process called electromagnetic induction. In contrast, an electric motor, made of the same components, acts in reverse where electrical current transforms into mechanical energy. By knowing how a generator works to power the world, you can be better equipped when it comes to choosing one to keep the family safe in torrential weather, bring life to your next tailgate party, or to power tools to get the job done. An electric generator isn't just some ubiquitous, utilitarian machine. Instead, generators are the lifeblood that keeps the world humming! Without them, we wouldn't have our modern-day amenities. From your car's alternator to a home standby or job-site portable, to even the Hoover Dam - generators are seemingly everywhere. Think of a generator as an 'energy engine' that converts kinetic (motion) energy into electricity. A generator consists of a stationary magnetic field (stator) in which a rotating electromagnet (armature) spins to produce electrical current. With a gasoline-powered generator, an internal combustion engine drives a rotating shaft that turns the armature. In renewable types of energy, wind, and water, for example, natural forces spin a turbine. If you think about it, any type of motion energy can be converted into electricity - just like hand crank flashlights. Learn the parts that work together to form a generator and the technology you should know when shopping for a generator of any kind. Frame - Sheilds electrical and moving parts. Keeps dirt and moisture out. 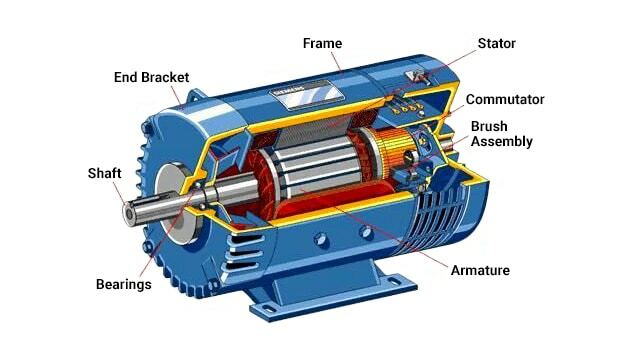 Rotating Shaft - Connected to a motor or propellers in wind/water generators. Bearings - Reduces friction caused by the rotation. Field Windings - A coil that creates a magnetic field through which current flows. Armature - Creates electromagnetic induction by spinning inside the stator of opposing magnetism. Stator - A stationary magnetic field with large copper windings. Commutator - A conductor through which electricity collects. Brush Assembly - Rubs against commutator that sends electrical current out. 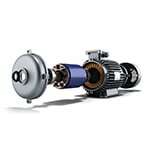 Many people ask, "What's the difference between an electric generator and an alternator?" The most significant difference is in design. While generators feature a stationary field in which the conductor rotates to produce electromagnetic induction, an alternator's entire magnetic field turns with its conductors remaining stationary. Generators are capable of both AC and DC power. 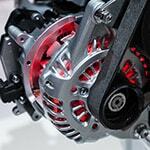 Alternators usually are made for A/C (alternating current) applications, hence the name "alternator". The inherent design differences allow generators to produce immense amounts of wattage per kilowatt and are, therefore, much more substantial. Likewise, alternators tend to be more economical, use fewer parts, and used in smaller load applications like automobiles. "But doesn't an alternator go inside a generator?" Sort of. Sometimes "alternator" generically refers to the joining of a rotor and stator as a part and not a standalone alternator. It's what separates the best from all the rest. When it comes to knowing the ins and outs of generator technology, our factory-trained experts are here to give you the tools and resources necessary. If you have questions or want to talk generators, give us a call. How Do Generators Produce Electricity?.. Our Power Equipment Direct how-to library can help you learn about How to Use a Generator for Tailgating, How to Get the Right Generator for Your Home and How to Save Electricity with Load Shedding.